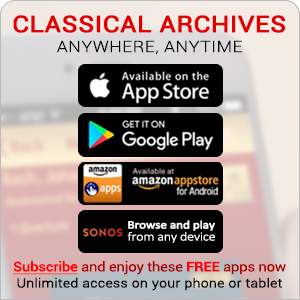 Welcome to the Classical Archives™ – a music website designed for a vital but often overlooked audience: lovers of Classical Music. 1,055,000 files you can listen to (stream), or purchase in DRM-free MP3 for download by 22,000 composers and 93,000 artists from over 680 recording labels. 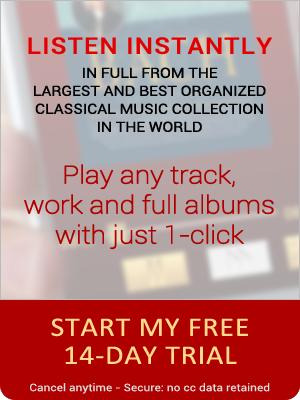 Also includes the largest collection of free classical music MIDI files. prs.net and prs.com are equivalent and also valid. TIP: Enter "prs" in your browser's address bar and press Control-Enter (IE/FireFox). Classical Archives was created in 1994 by Pierre R. Schwob while he was living in Hong Kong. The World Wide Web was at the beginning of its exponential growth and he published a small web page—The Archives of Classical MIDI Sequences—to share about 40 MIDI classical music files he had sequenced. At the bottom of the page, Schwob invited visitors to send him their own sequences. He emailed several potential contributors and explained that he wanted to provide a central location on the web where classical music MIDI files would be available and clearly cataloged to permit others to locate them easily. Rather quickly, the site attracted such important collections as the complete Scarlatti Sonatas by John Sankey and other wonderful sequences by Finley, Hisamori, Moclin, Yokochan and others. Soon after inception, the site moved under the URL www.prs.net – usually as a virtual server, hosted by friends who believed in the merit of such an endeavor and who agreed to provide space on their servers. Schwob maintained the site as a hobby, spending one to two hours each day to catalog the submissions and to answer what became a steady stream of correspondence from all over the world. The site became an important stop for classical music lovers on the net, and its value was underlined by the requests (usually granted) to mirror the whole site by several universities and organizations on different continents. In 1997, right after the reversion of Hong Kong to China, Schwob moved back to the U.S. and settled in Palo Alto CA, where he continued to develop the Archives. Then in 1999, he received an offer to sell the site to an outstanding group that had an intense interest in music and culture. But as the potential buyers and Schwob discovered that they were temperamentally well suited for each other, and as Schwob was not all that keen to completely let go of the site, it was agreed that the Classical Archives would be organized (Classical Archives, LLC) with Schwob as CEO, and the group would provide an infusion of capital to permit the Archives to expand its offering. Although the Archives continued offering most of its contents to visitors at no charge, it began seeking the support of its users so that the site could both grow and maintain its position as the premier web site for music and culture lovers. A subscription system was launched which allowed those users who wished to subscribe to do so by contributing $25/year for an Individual Subscription. Shortly thereafter, Maestro David Barg joined the Archives as Artistic Director. David is an internationally noted conductor with a deep commitment to music education and to working with young musicians and conductors. With David's help, the Archives launched its Featured Artists section, which offered live recordings in MP3 by outstanding orchestras, soloists and vocalists. David also created the Learning Center where he shared tips with other conductors and with music students. Many new features were soon added, notably the Classical Archives' radio station, a search engine allowing searches both by keywords and by composers; and timelines and historical displays that provided a historical context for composers and their music. The Archives was most proud of the continued addition of outstanding artists to its roster, largely due to the wonderful efforts of Dr. Leila Yangurazova, our ambassador in Moscow. When David, due to the pressures of his conducting schedule, had to move back to New York, we had the extraordinary good fortune to be joined by Dr. Nolan Gasser—now our Artistic Director—who is an outstanding musicologist (Stanford Ph.D.), composer, arranger, and performer with an unbounded enthusiasm for our mission. In January 2009, after an intense period of development, we launched the new Classical Archives with a much more aggressive mission: to include, in addition to our legacy content, the complete catalogs of the classical music record labels, in a new and completely redesigned website which we believe offers a quantum leap in music site design and navigation. Classical Archives uses a proprietary system (the Contextual Metadata Engine [CM-e]) that allows for the ingestion and cataloging of all recordings based on a musicologically accurate and uniform, canonical, metadata database. Because of the CM-e, visitors can search and cross-reference by various relevant criteria: composer, work title, artist, albums, historical period, instrument, and genre, in order to find and compare different recordings. At the core of our efforts is the work of a small army of dedicated musicologists who, under Nolan's direction, continue working tirelessly to catalog and properly classify the music we are adding to the new site so that it can be presented in a complete and sophisticated, yet intuitive manner. As we included music from record companies in our offering, we had to modify our subscription plan. We offer a monthly plan for $7.99/month and an annual plan for $79.90/year. We believe that we offer a compelling experience that is still at the low end of the current music services price spectrum. In addition, we offer 10% discounts on all music purchased for download by subscribers to our new service. Finally, and in keeping with our origins, we shall continue to offer free access to all our members to the many thousands MIDI files that are given to the Archives by our wonderful and committed contributors. Finally we must mention the tireless efforts of our administrative support team in La Jolla and San Diego. All these people are a joy to work with and their dedication and inspiration make the Archives an invaluable asset on the internet for all. We look forward to the continuing development of the Archives to fully realizing the mission inherent in our motto, The Ultimate Classical Music Destination™. All this is made possible by the happy marriage of technology and a great reverence for our cultural treasures. Born in Los Angeles, brought up in Geneva, Switzerland; lived 15 years in New York, 11 years in Hong Kong, now in Palo Alto, CA. Self-taught (except in flying); built his first computer in 1977; books published on history (translated into several languages), calculators (chosen as special selection of the Mathematical Book Club) and chess openings. Adjunct assistant professor computer science, N.Y.U. 1981-86; holder of several U.S. and foreign patents; founded PRS Corporation, an R&D company in 1978 where he developed the award-winning ID LOGIC® technology which was incorporated into a U.S. national standard and licensed to the major consumer electronics manufacturers. 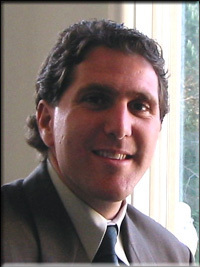 Appointed Co-Chairman & CEO of Classical Archives, LLC in August 2000. Pierre is a hopeful amateur musician who has served on the board of directors of several classical music organizations. A cosmology and astronomy groupie (asteroid 32890 Schwob has been graciously named after him), he helped establish the Computing and Information Center at the Kavli Institute for Particle Astrophysics and Cosmology at Stanford/SLAC. Happy on his boat, he is happiest scuba diving under it. He is blessed with his son Jonathan (1989) and his daughter Nathania (2001). Born and raised in Southern California, Nolan is a critically acclaimed composer, pianist, conductor and arranger, as well as a published musicologist. He received his Ph.D. in Musicology in 2001 from Stanford University, where he is an Adjunct Professor in Medieval and Renaissance Music History. 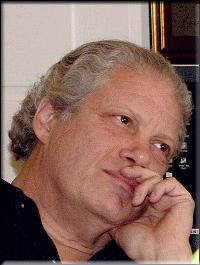 Nolan studied composition in Paris (and Fontainbleau) with Betsy Jolas, Gilbert Amy and Tristan Murail; received a Masters in Composition from NYU (studying with Todd Brief and Menachem Zur) and a Bachelors of Music degree from California State University, Northridge (studying with Aurelio de la Vega). He is the composer of numerous award-winning musical works, ranging in style from classical to jazz to popular, including music for the stage. His works have been performed in such prestigious venues as the Kennedy Center in Washington D.C., Alice Tully Hall, and La Salle Pleyel in Paris. His Oration on July 4th ? the first movement of his oratorio American Festivals ? for orchestra, chorus, and orator was premiered to great success at the Spoleto Festival in Charleston, SC in May 2004 by the Charleston Symphony and Chorus under Maestro David Stahl, and with actor Sam Waterston as orator. In February 2005, the Memphis Symphony Orchestra and Chorus, under Maestro David Loebel will premier the second movement of the oratorio, Black Suit Blues, for orchestra, chorus, and baritone soloist. Nolan also performs and records regularly with marquee performers as diverse as Steve Miller, John Handy, and Carol Channing. He recently enjoyed great commercial success with his holiday song, Christmas by the Bay. In all, Nolan brings to Classical Archives a rich and eclectic array of musical interests and expertise, along with a great enthusiasm for the mission and philosophy of the company. He lives in the Petaluma, CA with his wife Lynn, and their two children, Camille and Preston. Originally from the central Sierra foothills of California, Ronda has successfully taught music both privately and at the elementary, high school, and college levels for more than 25 years. She holds a Bachelor’s Degree in Music from Thomas Edison State University in New Jersey and a Master’s Degree in Flute Performance from CSU Sacramento where she was a Liberace Scholar performing with the university’s elite Liberace Quintet. 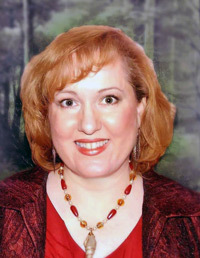 Ronda has served as Director of Instrumental Music for Lon Morris College in east Texas and as the flute professor for Texas A&M’s Tarleton University, in Stephenville, Texas. Ronda has performed with bands, symphony orchestras, Celtic ensembles, chamber ensembles, and flute choirs in the U.S., Europe, and Asia. Ronda has collaborated with several award-winning musicians including internationally acclaimed songwriter and keyboardist Roger Scott Craig and Grammy-nominated folksinger Grace Griffith. Ronda’s discography includes By the Tule River’s Edge on Tule River Records, Tracy Harris Live in Concert: Music of Harvest and Holly, Grace Griffith: My Life on Blix Street Records, and MUSe: Flute Music by Christopher Caliendo on Tule River Records. Ronda’s recordings are also featured online in the Caliendo World Music Soundbyte Catalog. Ronda regularly performs on a variety of concert and world flutes including the bass flute, Irish flute, recorder, and Shakuhachi. As a music professor, Ronda regularly teaches courses in Music History, Jazz History, American Music, and Music Appreciation. She is a collaborating member of Summer-Winter Studios, a group of educators who develop online resources in Music History education. Barry Lenson fell in love with classical music when he was growing up in the 1950s, the age of the LP. By the time he graduated high school, he had a too-big collection of recordings. He starting taking singing lessons when he was 19, and went on to earn a B. Mus. in voice from McGill University and an M. Mus. in voice from the Yale School of Music, where he studied with the great American soprano Phyllis Curtin. After graduating, he moved to New York and sang tenor roles with smaller opera companies. He was coordinator for the chamber music program at the Manhattan School of Music for several years and while there, he began to write. He went on to take supervising editorial posts for three newsletter publishers in New York. Where writing is concerned, he has never looked back. 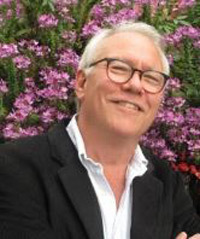 Barry was Editor-in-Chief of the now-defunct New York Opera Newsletter, where he interviewed many leading opera singers, stage directors, and conductors. He has written and co-authored more than a dozen nonfiction books (including the Amazon.com self-help bestseller Good Stress, Bad Stress), two novels, and a book of short stories. Barry writes blog posts, newsletters and website copy for a number of companies, but his most cherished role is with Classical Archives, where he writes blog posts, newsletters, and other materials. Barry is married, has one daughter, and is a regular audience-member at the Metropolitan Opera and the New York Philharmonic. "I am a complete believer in Classical Archives," he says. David is internationally recognized for his work with young musicians and conductors. 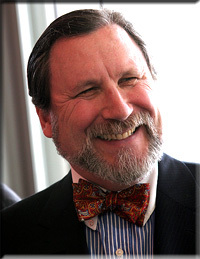 The co-founder of the Barg-Fritz Institute for Continuing Conductor Education, he led the opening session of the Metropolitan Opera Guild's Winter Choral Directors Workshop in spring 2002. His conducting workbook is in pre-publication. Barg works with young musicians and conductors throughout America and around the world. In North America in 2001-02, Barg worked with young orchestras in Houston, Las Vegas, Los Angeles, New York, Philadelphia, Washington, Baltimore, Boston, Kansas City, Atlanta, Miami and elsewhere. Barg has conducted professional ensembles in the US, Europe, Russia, Australia, and has been a Cultural Ambassador for the United States Information Agency. He recently made his debut with the Moscow State Radio & Television Orchestra at the Great Hall of the Moscow Conservatory, a concert that was recorded for Russian radio and on CD. David has a daughter, Vanessa. Born in Tashkent (former USSR) her early years were dedicated to ballet, piano, Russian literature and mathematics. After the catastrophic earthquake of 1966, she moved to Moscow where she graduated from the mathematics department of the physics faculty at Moscow University. She worked in various branches of geophysics, astrophysics, lasers, and ecology. She earned her PhD in 1988 after defending her thesis on The Collapse of Dense Stellar Clusters at the Institute of Cosmic Research of the Russian Academy of Science. Following "Perestroika," she immersed herself in several social and cultural causes. She became involved with The Seasons, a Moscow chamber orchestra. She wrote an article on J.Krishnamurti which was later reprinted in several of his books. She produced the successful tour of the famous classical Indian singer Shobha Joshi which was broadcast by the major Russian radio stations and NTV (1999). Since then she is a regular participant in radio shows. She also appeared in several Moscow and Tatarstan radio programs about Islam (autumn, 2001). 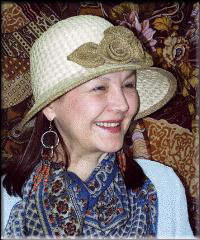 She was a charter member (CTM) of The Toastmaster International Club, (The Moscow Free Speakers) of which she became President in 1995, and now she is working on establishing the second TM Club in Moscow. Her son Shamil Sunyaev is a molecular biologist who heads a laboratory at the Harvard Medical School in Boston. Omar was born in 1976 in Rio de Janeiro, Brazil. With his academic studies behind him, in 1997, he began the Music Graduation Course at the Rio de Janeiro Federal University, studying under professors such as pianist Sonia Maria Vieira, composers Marco Pereira, Ernani Aguiar and flutist Eduardo Monteiro. In 2001, Omar relocated to Moscow to improve his skills in composition at “The Russian Gnesin's Academy of Music”. There, he studied under Professors Gennady Tchernov, and Kiril Volkov. 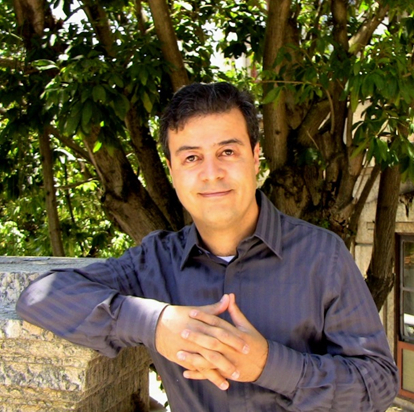 Fadul is a prolific composer with pieces ranging from chamber music to symphonic works. He also had a weekly show called “The Music” in the Russian State Radio “Voice of Russia”. The show presented interviews, comments and analysis on classical music. Still in Moscow, he started working with pianist Natasha Nikiforova. They began playing as a duo in 2001 under professor Leonid Block, at the “Gnesin's Academy”. They have played in various cities throughout Russia and abroad. In April of 2006 they were awarded the first prize in the International Chamber Music “XXI Century Art”, in Kiev, Ukraine. In 2006 and 2007, Omar had the pleasure of attending classes under professor, pianist Jose Ribera, head of the Piano Department at the Royal Danish Academy. Omar has earned his Masters Degree in flute performance at the Ohio State University, in 2009, under Professor Katherine Borst Jones. He is the musical director of the “Uniarte Institute” in Rio de Janeiro, which organizes and manages several concerts and other attractions each year, in Brazil. He also personally organizes concerts and master classes in many different cities, in Brazil. Besides of that, Omar regularly plays concerts with a repertory ranging from barroque to contemporary music. Kim Ngan Nguyen is a Vietnamese pianist, who linked her destiny with the Russian culture since the age of thirteen when she came to Moscow to study abroad. Kim Ngan studied at the Central Music School named after Tchaikovsky, her teacher was F. Nurizade. In Tchaikovsky’s conservatory in Moscow, in 2008 - 2013 she studied with professor A. Strukov, where she greatly improved her skills. After that Kim Ngan continued her post-graduate studying with professor M. Voskresensky. 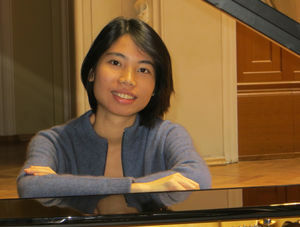 Miss Nguyen is a laureate of four international competitions. She won 1st prize in the International Nikolai Rubinstein competition and 1st prize in the International competition of Scriabin’s Russian Conservatory (Paris 2008, 2009). In 2011 she took part in the Moscow Olympus Music and received second prize and two years later, she won the third prize in the distinguished Fifth International Alexander Scriabin competition in Moscow. In the 20th anniversary of newspaper “Moscow Music Review” (2009) she played Chopin’s second piano concerto in the Moscow Philharmonic concert hall. Her performance impressed the public with a true poetic interpretation. All artists in this concert were 20 years of age. In that same year she had a brilliant premiere of Schuman and Chopin piano concertos with the Symphony Orchestra of Ho Chi Minh city. After this concert the press wrote about her art as “The pianist performed this compositions with eloquent passion and true poeticism. Great Schuman, bravo!” In 2010 she gave recitals in Hanoi. Critics accented the influence of Russian tradition in her performance of Rachmaninov’s Etudes – Tableau and In 2012 miss Nguyen was invited by conductor K.Masluk to play Scriabin’s Piano Concerto with the Symphony Orchestra of Kirov city. The pianist dedicated the season 2013-2014 to the project “24 preludes and fugues” J.S.Bach, 1st volume of Well Tempered Clavier. Kim Ngan played this program in Dubna and Moscow, after that she recorded this cycle in the Grand Hall of Moscow Conservatory on 16th, 17th of October 2014.